Love is a Racket (1932) Directed by William Wellman. Douglas Fairbanks, Jr., Ann Dvorak, Frances Dee, Lee Tracy, Lyle Talbot, Warren Hymer. (72 min). A Broadway columnist walks "Up and Down Broadway" mingling with both the racketeers and the swells. His sweet-faced girlfriend has a weakness for writing rubber checks and crosses paths with a smarmy gangster. This fast paced yarn bounces between comedy and murder, aided by sparkling performances and director Wellman's sure hand. Fairbanks and Tracy are roommates in a book-strewn apartment where the door is always unlocked so their friends can wander in for some bootleg booze. Doug Jr. plays a part intended for James Cagney and modelled on true-life columnist Walter Winchell. 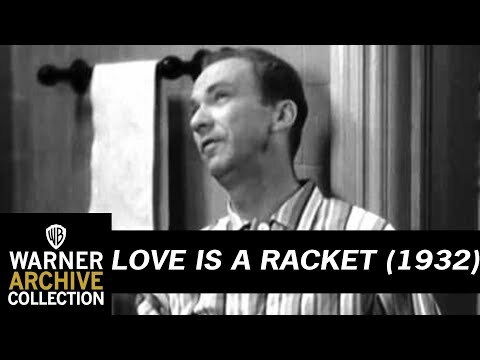 Love is a Racket has electrifying language (getting drunk is "swacko") great overcoats and a swanky penthouse, in every way the movie dream of Art Deco New York.